Convertible car seats can be installed both rear or forward facing. Children under 1 year old and under 22-lbs should always ride rear facing. While parents can turn a child forward facing legally at 1-year, it is our recommendation that children remain rear facing until 2 or longer. 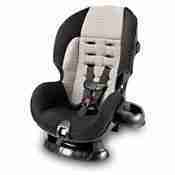 Palm Beach Convertible Car Seat Rentals installed both rear or forward facing. This convertible car seat is a basic transitional car seat, meaning it is for children too large for an infant seat but not yet large enough for a toddler car seat. Children under 1 year old and under 22-lbs must always ride rear facing. Parents can turn a child forward facing legally at 1-year. However, the NHTSA and APA recommend that children remain rear facing until age 2 or longer. If you require a rear facing convertible car seat with an increased rear weight limit, call us for suggestions. We have a variety of Palm Beach convertible car seat rentals, thus can accommodate many needs. Installation Video using LATCH system. Our cleaning process is extensive. We clean Car seat shells with Simple Green D pro 5 after each rental. Simple Green D Pro 5 cleanser is a hospital grade disinfect for bacterial, viral, and mold/mildew. Also including MRSA, Hepatitis B & C,Herpes Simplex Virus Type 1 & Type 2, HIV/AIDS virus, Human Coronavirus, Avian Influenza and many more. Fabrics are fully laundered in dye and perfume free detergents. We also steam clean at 160 degrees to kill possible bedbugs and lice. Therefore, no other baby equipment rental company in Palm Beach offers this level of sanitization.